Work in the build to rent, student accommodation, later living, or assisted living sectors? 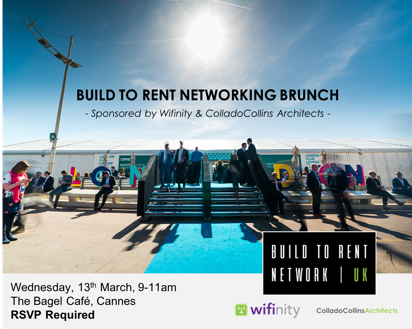 Then you cannot miss the The Build To Rent Network UK Brunch for a morning of stimulating conversation on industry matters with friends and colleagues over an artisan french pastry and light refreshments at the Bagel Cafe. Due to a limited capacity, registration to this event is essential! For more information, and to reserve your place, please follow this link, click “Register to attend”, and complete the short form. We look forward to welcoming you to the event and wish you a successful MIPIM!